From classic literature (we're looking at you, White Fang), to Game of Thrones and famous Instagram animals, it seems like wolf dogs are everywhere these days, and for good reason! These somewhat wild canines aren't just beautiful—they're super intriguing and mysterious, too. Beauty and mystery aside, there's a lot of controversy surrounding wolf dogs—and debate about whether or not they're safe pets for families. 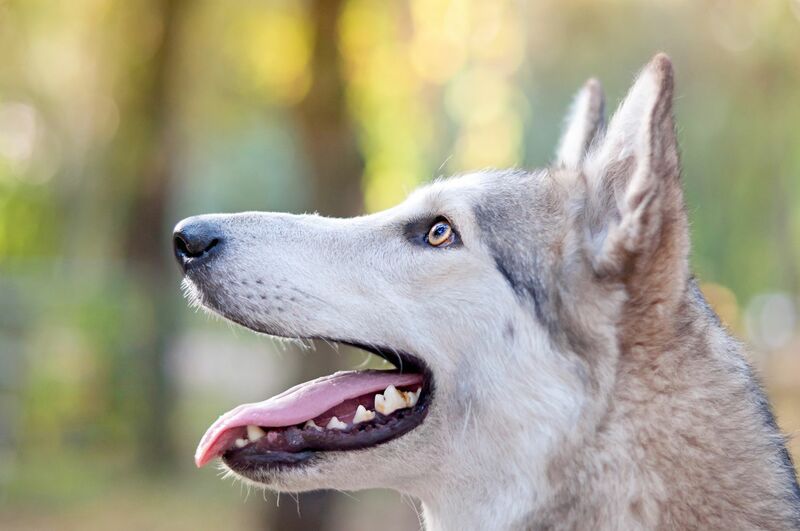 If you're considering adding a wolf dog to the pack, read on for some vital facts about wolf dogs, their behaviors, and their legality. Note: Many vets and experts warn against breeding wolves and domesticated dogs due to a number of factors and encourage interested pet owners to do thorough research before deciding to adopt. What, exactly, is a wolf dog, you ask? Like the name implies, a wolf dog is a hybrid of a wolf and a domesticated dog—Siberian Huskies, Malamutes, and German Shepherds are the most commonly crossed domesticated breeds. Both wolves and domesticated dogs are "interfertile," meaning they're genetically similar enough to interbreed, but these hybrid pooches rarely occur in nature because wolves are super aggressive and territorial. And, yes, it's true that all dogs have some wolf in their ancestry, but an animal can only be considered a true wolf dog if they have a pure wolf ancestor within the last five generations. Believe it or not, the first wolf dogs were actually hybrids between wild wolves and Pomeranians. The Pomeranians of the 18th century, however, were not the "purse pooches" they're known as today. Rather, they were large, muscular working dogs that were used to herd animals and pull sleds across tough, snowy terrain. Like many other dogs that are considered "dangerous," there's some controversy around wolf dogs—and whether or not they make good pets. While some say they're loyal, loving, and totally trainable animals, others claim they're too wild, aggressive and unpredictable. The truth is, there's no "typical" wolf dog and no way to predict how "wolf-like" it will be. Accordingly, there's much more variety in behavior and temperament than, say, a Golden Retriever, which may be tough for pet parents who aren't willing to put in the time—and patience—to raise a wolf dog. Unfortunately, there isn't an approved rabies vaccine for wolf dogs, so any wolf dog that bites a person or another pet can be considered a rabies risk. Wolf dog owners are encouraged to vaccinate their pets but only have two not-so-great options: They can lie to their vet about their dog's heritage or sign a waiver that acknowledges that their wolf dog's vaccine doesn't provide full protection from rabies and that their pet can be put to sleep if he or she bites someone. Wolf dogs are usually classified by their filial number, or the generations removed from a pure wolf. F1, for example, represents the original breeding between a wolf and a domesticated dog, or a wolf and wolf dog, while F2 represents the second generation. Because wolf dogs' genetics are so difficult to trace, it can be tricky to determine whether or not your dog is a true wolf dog—or a standard, domesticated dog that has been bred to have a wolf-like appearance. This blurriness makes it extremely hard for states to establish legislation around wolf dogs being kept as pets—and many have made it out-right illegal, while others allow restricted ownership. If you're considering adding a wolf dog to the family, do your research to ensure owning a wolf dog is legal in your state. Although many litters of domesticated doggies share several physical and behavioral traits, wolf dog pups can look and act unlike any of their brothers and sisters. Why? Some pups in the litter may take on more characteristics of the domesticated dog, while others could take on more characteristics of the wild wolf. Like we said, there's no true way to predict your wolf dog's degree of wolfiness as she grows into an adolescent and adult. Yup, you read that right: If your wolf dog tries to lick your teeth, you should allow them. Why? It signals that they recognize you as a member of their pack. Just like wolves in the wild, wolf dogs show their love and appreciation by licking each other's teeth. If you try to move away while your wolf dog is performing this ritual, they'll feel rejected from the pack—and hold your face in their mouth until you complete the greeting by licking her teeth back. Wolf dogs are usually recommended for people who live in the wilderness or woods because they need a ton of space to remain happy, healthy, and exercised. Some resources recommend an area of at least 65x65 square feet with plenty of trees and obstacles for the wolf dog to climb. Nope, the standard kibble you feed your other dogs won't do it for a wolf dog. They need two to four pounds of raw meat daily. Feeding your wolf dog regular dog food won't provide him with the nutrients he really needs. There are countless reasons why wolf dogs howl, from communicating with another wolf dog (or wolf! ), to telling another dog to stay off her turf, to hearing a siren in the distance. If you bring a wolf dog home, be prepared for a lot of howling. Do Your Dog's Knees Pop In and Out? Learn About Luxating Patellas! What Can You Do About Bladder Stones in Dogs? Is Lettuce Safe for Dogs?